It is no secret that all dogs like barking - it is their way of communicating. The only difference is that some dogs bark for a good reason, while others for apparently no reason at all. It is also a well-established fact that certain dog breeds are more prone to barking than others. Since barking is natural, the barking itself is not the problem. The problem is making your dog quiet at certain times or when commanded. You can make your dog stop barking by gently closing its mouth, asking it to bring you something, creating distractions, training it to bark on command and using bark collars. Bark collars are relatively new but an efficient weapon in the anti-bark battle. With so many different types and brands of bark collars, choosing the Best bark collar can be challenging. To help you make the right decision, we wrote this short bark collar buying guide and reviewed the 5 Best Bark Collars. Bark collars are specifically designed to automatically set off an interrupter when the dog starts barking. Their purpose is to negatively reinforce the barking behavior. If purchasing a sonic bark collar, you need to look for a model with adjustable sizing. You also need to look for a model that emits sound inaudible for humans. If purchasing a spraying collar you need to look for a model that sprays harmless, all-natural and hypoallergenic spray. If purchasing a static collar you need to look for a model with adjustable size and adjustable intensity of the correction stimuli. There are also static collars that transmit a short beeping sound for alarming the dog prior to correcting it. It is always advisable to choose a waterproof static bark collar. Size –this is important because the intensity of the collar’s deterrent depends on the collar’s size. If the collar is too big, chances are the stimulus will be too intense. Material –it is important that the collar is made of a material that is comfortable to wear. Type of collar – depending on the technology used, there are three types of bark collars. Those are static, sonic and spray collars. Style –the style of the collar should suit your dog’s body shape and personality. 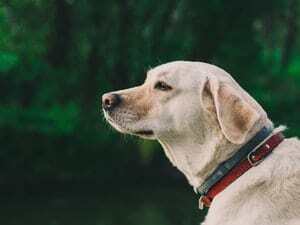 Temperament –the collar’s style should fit your dog’s personality. Allergies –some dogs can be allergic to certain materials. Make sure your dog can tolerate the material you choose. Personal taste –you need to like the collar you are purchasing. Your dog will be wearing it for a relatively long period so make sure you choose something that pleases your eyes. Budget –high-quality collars are more expensive but more reliable and effective. The exact instructions and tips for using bark collars are provided with the collar itself. Nevertheless, there are some general rules and guidelines. First of all, you need to properly introduce your dog to its new bark collar and test how the collar works in controlled environment. Secondly, leaving a group of dogs while one or several of them are wearing bark collars, unsupervised, is not recommended. Even the best bark collars are still devices and can easily malfunction. In addition, even well-behaved dogs can overreact and act weird if they experience extreme reaction to the stimulus provided by the collar. Last but not least, it is important to mention that the bark collar should be used only during the training period. Once the training is finished the collar goes off. However, some dogs require retraining. Depending on the type of correction method they use there are three different types of bark collars – barking collars that use spray, barking collars that use tone and barking collars that use stimulation. Depending on the type of bark collar control there are two different types – automatic and handled. Although their applications differ, they are both equally effective. Automatic Dog Bark Collars–are good for correcting the dog when the owner is not around. Bark Collars With Remotes – can be controlled by the owner via a remote. Shock / Pulse Collars – deliver electrical shocks or pulses of different intensity and duration. Vibration Bark Collars – use vibrations with different intensity. Citronella Bark Collars – when the dog barks, the collar emits a safe but unpleasant citronella smell in front of the dog’s face. Ultrasonic Bark Collars – emit piercing ultrasonic tones. 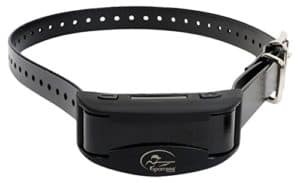 Due to its advanced training technology, The SportDOG 10R Rechargeable Bark Collar is considered the first choice for dog parents looking for the best bark collars. It is the number one option on many bark collar review lists. The collar is made of high-quality, long-lasting and waterproof materials. The durability of this product is prolonged by its rechargeable battery. The collar’s sizing can also be adjusted. This bark collar is specifically designed to allow your dog to set its training pace while avoiding over-correction. Instead direct punishment, the collar’s system avoids over-correction by getting your dog’s attention and interrupting its barking pattern. The collar uses both sound and vibration to get the dog’s attention. It also features an automatic safety shut-off. The SportDOG 10R Rechargeable Bark Collar can be adjusted to work in three differently intense strict modes. Those modes include Temperament Learning, Progressing Correction and User-Selected Correction. The different modes enable modifying the training regime. All in all, the above mentioned technology provides efficient and fair but firm and consistent bark control. Frequent complaints about the guarantee policy. The Dogtra YS300 Dog Collar is the most compact and smallest bark collar in the Dogtra range. It is a static type of bark training collar, triggered by the dog’s bark. The no bark collar features a special sound recognition sensor technology capable of differentiating between barking sounds and surrounding noises. The intensity of the correction stimulus can be well adjusted according to the dog’s size, training phase and temperament. The collar features 7 different levels of intensity. 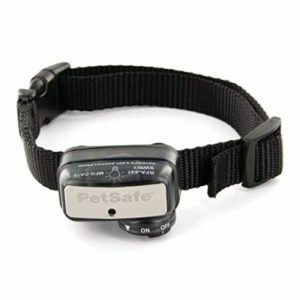 Because of the adjustable intensity, the collar is suitable even for small dogs (above 10 pounds). The Dogtra YS300 Dog Collar features a special system that emits a non-electrical vibration warning prior to the actual correcting stimuli. The collar is powered by rechargeable Lithium Polymer batteries that can fully recharge in only 2 hours. The collar has a LED indicator light that shows the battery life. The collar is fully waterproof but not submersible. The Garmin PT10 Collar features a special built-in Bark Limiter with advanced and specifically developed Bark Correction Technology. The system also features remote-operated LED beacon lights suitable for low light conditions. For optimized and reliable performance in wet conditions, the collar features two lengths of stainless steel-made and insulated contact points. The special design also enables extended comfort for any coat length. Made of high-quality materials, the collar is tough, durable and waterproof. The collar is available in a blue color. Since the PT 10 dog device works with both the PRO 70 and PRO 550 handhelds it allows adding more dog device collars to the pack. The system can sustain training up to 6 dogs on 1 PRO 70 handheld or 3 dogs on 1 PRO 550 handheld. The system has 1 mile range with 27MHz. The Garmin PT10 Collar is powered by one Lithium ion battery. The system comes with one year warranty. The PetSafe Elite Bark Control Collar aids the anti-barking training by using a specifically blended combination of deterring technologies. These technologies include vibration and sound. The system is designed to gently correct the dog’s unwanted barking behavior by emitting a highly uncomfortable but completely safe static shock. The PetSafe Elite Bark Control Collar features a smart design that allows the intensity of the shocks to gradually increase as the dog keeps barking. As soon as the dog stops barking, the shocks stop too. The concept behind the increasing shock intensity is that the dog will learn to stop its barking before the extent of stimulations becomes uncomfortable. The device has 10 levels of static intensity. This high-quality and well-made no bark collar is specifically designed for smaller dogs weighing between 8-55 pounds. Both the collar and the intensity of the emitted correctional stimuli are more suitable for smaller dogs. The collar is available in different colors. The PetSafe Gentle Spray Bark Collar works with spray technology. It uses a gentle spray of citronella scent to make the dog stop barking. As a gentle anti bark training option, this collar is suitable for sensitive dogs that get scared easily or do not respond well with other training collars. The collar is extremely easy to use. Once the spray is used it can be replaced with a new refill canister. One canister is enough for spraying 300 to 400 times. Due to the overpowering effect of the citronella scent, this collar is suitable for dogs weighing over 6 pounds. However some dogs can get used to the smell and ignore the stimuli, thus continuing to bark. Luckily, the refill canisters come in differently scented fragrances. By frequently changing the fragrance, the efficiency of the collar can be significantly prolonged. The PetSafe Gentle Spray Bark Collar is powered by a long-lasting and non-rechargeable battery. The citronella scent affects the general household’s smell. The most important step to addressing excessive barking issues is identifying the cause. Dogs usually bark due to territorial reasons. Some dogs use barking as an attention-seeking and learned behavior. When these dogs start barking, the owner gives treats or attention in order to calm them down, thus accidentally reinforcing and rewarding the barking behavior. Other dogs bark when bored or when feeling alone. Therefore determining the right barking trigger is important for solving the problem. In recent years, the popularity of the best bark collars as anti barking training method has significantly increased. Anti bark collars help successfully manage and resolve nuisance and excessive barking. They are particularly useful for situations where the owner is either not present or unable to otherwise correct the barking behavior. Keep in mind that different dogs respond to barking collars in a different manner. The time it takes for dogs to unlearn their nuisance barking behavior varies. Some dogs are fast learners and some are tenacious and like sticking to their old habits. It is also important to understand that just using the collar is not enough. You also need to be consistent, patient and reinforce your dog’s positive behavior.